Herringbone, named after the skeleton of the herring fish, is a popular pattern that can be seen in many sorts of applications, from road paving to wood and tile flooring to wallpaper to jewellery to textiles. In textiles, herringbone is a variation on the twill weave where the diagonal wales alternate direction every given number of warp yarns, resulting in a broken zig-zag appearance. This is not to be confused with an unbroken zig-zag weave, known as chevron. 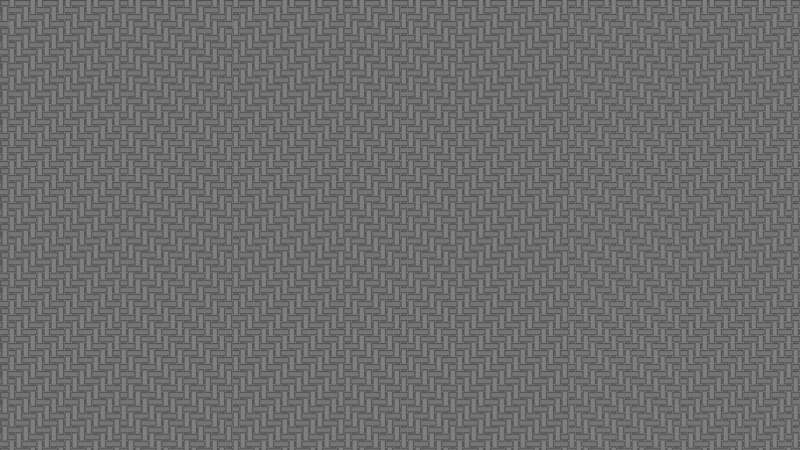 The herringbone weave can be found all over menswear; you’ll see it on suits, sports coats, overcoats, morning coats, morning suits, shirts, ties, braces, hats, caps and scarves. The herringbone pattern can also be knitted into a sweater or polo shirt. Though the herringbone weave is a basic and popular variation on the most common weave for a suit, the twill weave, herringbone suits are few and far between. Not even Daniel Craig’s James Bond, who costume designer Jany Temime dressed in three herringbone suits for Skyfall and Spectre, has been able to bring the herringbone suit to mainstream fashion. 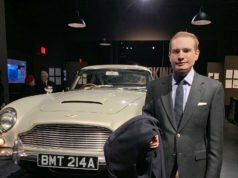 The herringbone suit started for James Bond with Sean Connery in Goldfinger, when Bond wears a blue herringbone flannel suit to Q’s lab, where he first lays his eyes on the classic Aston Martin DB5. 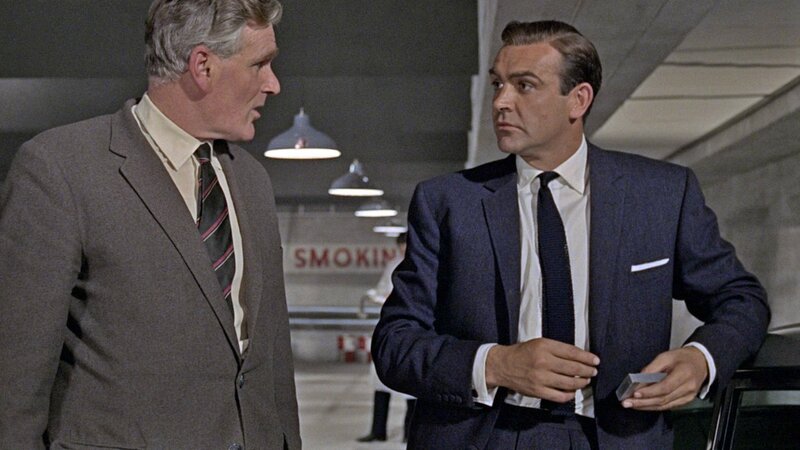 Since then, the other five James Bonds have worn herringbone suits. There are different ways the herringbone weave can be treated for suitings. When the cloth is woven in a single colour, the herringbone effect is very subtle and creates the impression of self stripes. 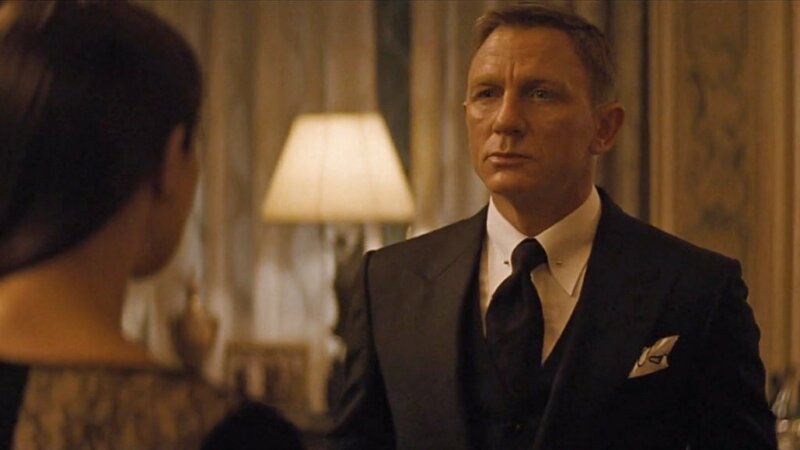 A suit made of such a cloth, like George Lazenby’s navy herringbone three-piece suit in On Her Majesty’s Secret Service or Daniel Craig’s black herringbone three-piece suit in Spectre, is still a solid suit—not a striped suit—and can be worn the same way as any other solid suit. Hence, the solid herringbone suit is a very versatile suit. One only has to be careful not to pair it with other herringbone weaves in a similar scale. The herringbone weave is commonly woven with different colours in the warp and the weft to emphasise the pattern in the weave. The more contrast there is in the pattern, the less formal and more sporty a suit will be. Sean Connery in You Only Live Twice and Timothy Dalton in The Living Daylights both wear worsted herringbone suits woven in black and white. Both of their suits feature the black-and-white pattern on a small enough scale to be read from a distance as grey, and the same self stripe effect seen on the solid herringbone suit can be seen here. When in a small scale like on these two suits, the overall semi-solid effect is similar to pick-and-pick. 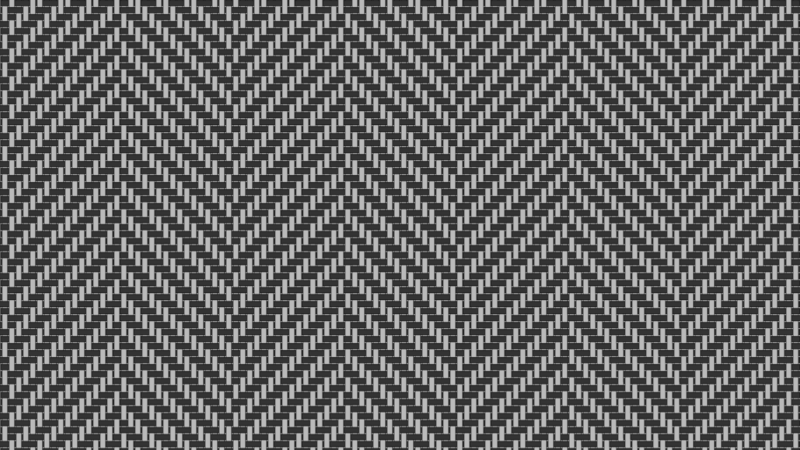 In tweed, the alternating herringbone pattern is done on a larger scale and is thus more obvious. 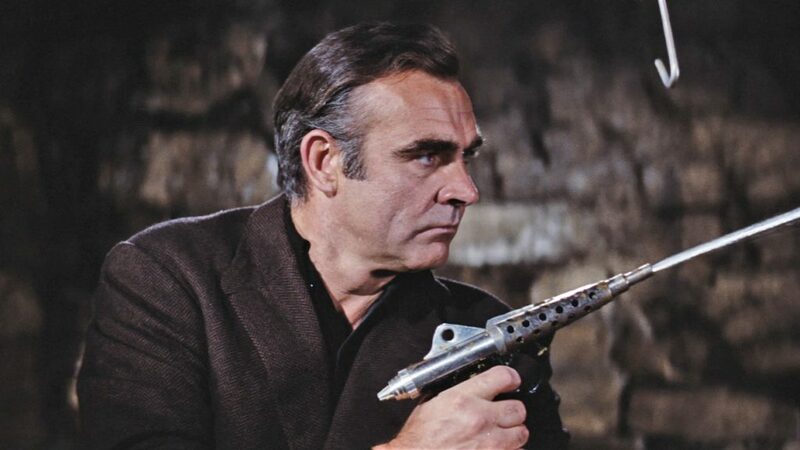 Sean Connery’s brown and black tweed jacket in Diamonds Are Forever is a good example of this. The herringbone weave and pattern here creates an interesting texture for a sports coat that is still subtle and elegant enough to follow in the James Bond tradition. Though Connery only wears the large herringbone tweed in a jacket, it can also make for a versatile sports suit. Herringbone suitings not only vary in how colour is treated but also vary in scale. 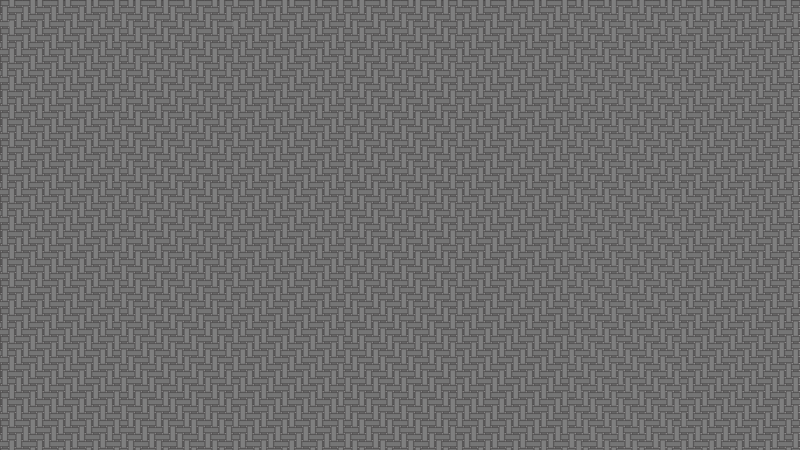 The smaller variations on the herringbone weave can be called a small herringbone, narrow herringbone, mini-herringbone or mini-bone. The herringbone weave and resulting pattern is more subtle in the smaller repeat, and the perceived self stripe on these weaves is narrower. Roger Moore in The Man with the Golden Gun and Daniel Craig in M’s office at the end of Skyfall wear mini-herringbone suits. 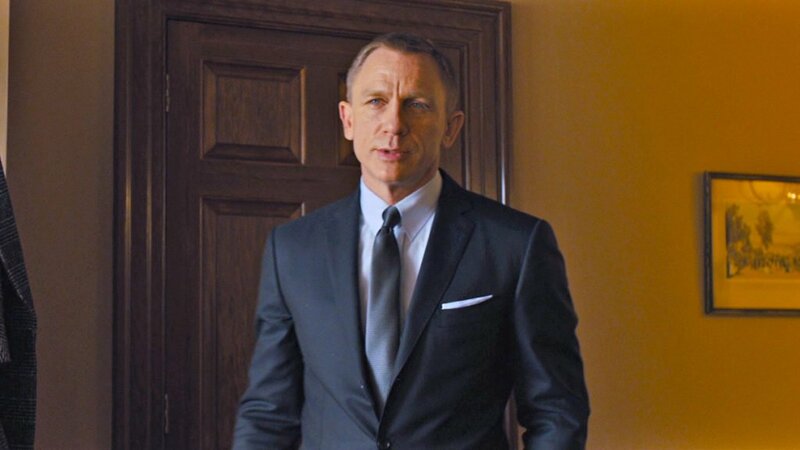 Daniel Craig wearing a navy mini-herringbone suit in Skyfall. Notice how the weave is hardly noticeable! The small herringbone weave gives the suit subtle interest without drawing attention. Though herringbone suits are most often made of worsted wool, herringbone suitings can be made of almost any kind of fibre. Bond’s first herringbone suit mentioned above is a woollen flannel. 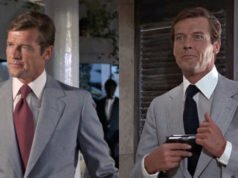 In The Man with the Golden Gun, Roger Moore’s mini-herringbone suit has a sheen that suggests it’s a mohair and wool blend. In The World Is Not Enough, Pierce Brosnan’s cream herringbone suit is made of linen, and the herringbone weave prevents the linen from wrinkling as much as the standard—yet more breathable—plain weave for linen. Daniel Craig’s grey narrow herringbone track stripe suit in Spectre is made of a blend of worsted wool, silk and mohair. 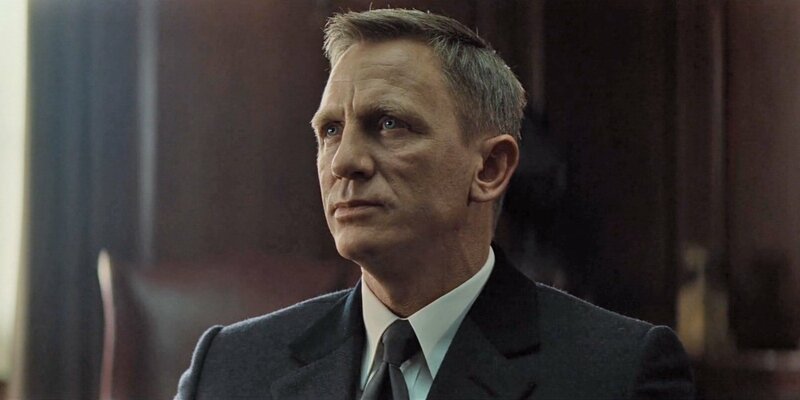 Apart from suits, James Bond has worn many herringbone overcoats (like the navy Crombie-style coat in Spectre), a navy herringbone rain coat in Casino Royale, a grey herringbone morning suit in A View to a Kill and a brown and black herringbone sports coat in Diamonds Are Forever. Though Bond never wears herringbone shirts, they make a fine alternative to the simpler and more common poplin and twill shirtings, and in white they can be amongst the most formal of shirtings. 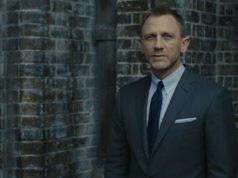 With Daniel Craig’s fashionable wardrobe in Spectre consisting of two herringbone suits and a herringbone Crombie-style coat, the herringbone weave is as relevant as ever. Considering its versatility, it’s a shame herringbone is not more worn or readily available in all kinds of clothes. Consider it for your next suit or anything else. I got made a 6×3 double breasted blazer in a black and white herringbone and it’s become a favourite of mine. Never thought about herringbone shirts, though. Might get a white one next time I have a shop. Great article Matt as always,keep up the good work. I myself have always warn Herrington suits and still own a few.They are quite a common option in the more traditional menswear shops in the UK and they normally sell them in charcoal or navy. I myself work in the legal profession in the City and they are a very popular choice amongst lawyers of all seniorities. Apologies but my spell checker has played havoc with the post above. Hope it still makes sense. Herringbone is one of my go-to suitings, it’s perfect for more sober occasions but still has a lot more depth than a plain weave. I have three herringbone suits, a navy, charcoal, and a tan. I also have a herringbone tweed sport jacket and a number of shirts. But, as with all patterns, it’s best to wear only one article of a given pattern at a time! If the herringbones are done much differently, like on Daniel Craig’s mini-herringbone striped suit and herringbone Crombie coat in Spectre, it’s possible to wear two of the same pattern. Anyone know how to protect a herring bone suit? the moths thought my connery style of oxxford was a buffet. I love herringbone weave as well. Mason & Sons are offering Anthony Sinclair Chesterfield overcoat in navy herringbone. It looks beautiful in the photos. Is it just me or are the older suits just constructed better? It’s just you! Tom Ford suits are better-constructed than many English bespoke suits. What exactly is meant by “constructed”? I’m using it to mean the level of detail care everything is put together with, which is what I assumed saul meant. Tom Ford’s suits have as much handwork as many English bespoke suits have, yet the handwork is done with more care. So the master has spoken…you got me. …but no one can take notice of that because of their most absurd fit in SF and SPECTRE. Only the black one is quite well-cut. Very interesting. For my future first made-to-measure suit, I am considering dark cloths such as herringbone, pick-and-pick and flannel. 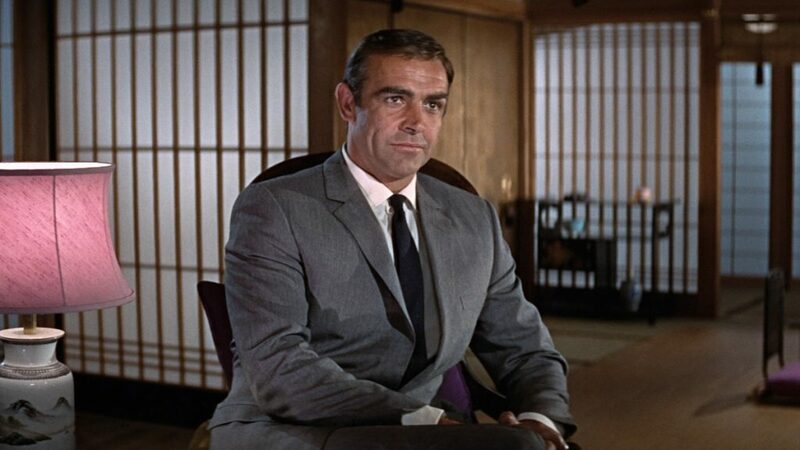 Matt, you mentionned the Goldfinger suit might be a herringbone in woolen flannel. Does such a thing as a herringbone in worsted flannel exist ? Also, do you think the self-stripe effect due to the herringbone has the consequence of making the person slimmer ? And the pick and pick making a cross hatch effect, can it make the person look bigger overall ? Or is the effect negligible ? A worsted flannel could certainly exist, but I don’t know if anyone makes it. The stripe effect in a herringbone could help a little with slimming so long as it’s the type of herringbone that will read as a self stripe. The herringbone on Connery’s tweed jacket won’t do so much. The effect of pick-and-pick on a person’s size is negligible. Is this worsted flannel? I’m no expert. I believe that is indeed a worsted flannel. In a recent interview lindy hemming said gray and midnight blue are in bonds world. 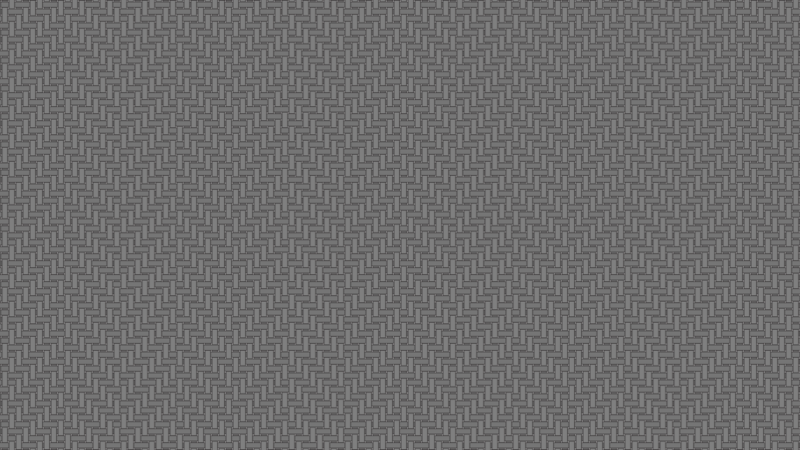 Can gray and midnight blue be worn with any skin tone? I ask because the Felix Leiter of my life (aka best friend) is of Indian descent. Grey and midnight blue can be worn by a South Asian complexion just fine, but there are other people who cannot wear it. MGM/Sony just released some 4k Bond films on iTunes, I wonder if they show something we don’t already know? Unfortunately the HDR part is done on the fly by the new AppleTV since Bond movies have not been remastered in HDR10 or DolbyVision yet, which would really help with patterns and such. Add to hat the larger REC2020 color gamut and midnight blue might actually appear non-black. Something to look forward to, though. Is a herringbone necktie along with a herringbone suit a bit too much? I think they will clash. I love the herringbone pattern. I own a grey herringbone sports jacket, and a solid navy herringbone two piece suit; they’re also the pieces I get the most compliments on when I wear them. I see lot of places offering it more and more now, but they generally stick with navy and dark grey colours. Great article, Matt. You always find something new and interesting to share. I’ve never had a herringbone suit, I must admit (though my brother-in-law has had a beautiful navy blue herringbone suit for several years). However, I can thoroughly recommend herringbone weaves for shirts. I’ve had ready-made herringbone shirts from Turnbull and Asser in white, cornflower blue and salmon pink. They were always the softest of all the casual shirts I owned (I guess because of the weave) and were surprisingly crease resistant. I really like the subtle herringbone, especially the look Lazenby shows with the Navy three-piece. It also looks great in gray, in my opinion. Up to this point, two of my suits – both from Anthony Sinclair – are already dark – midnight blue herringbone 16oz worsted. The color and texture is amazing. Made it way better to wear than just twill or plain navy blues. I would completely recommend having a dark blue worsted herringbone suit in one’s closet. As I have posted elsewhere, I recently purchased a Special Order navy blue herringbone from Mason & Sons. The fit, quality, and service are all top-notch.